Every time I go back home to visit my parents, there's always some computer thing that needs fixing (as is the case for most reasonably tech savvy people my age). My mom can do computer stuff. When my parents lived in Japan she had to do most of her communicating with the Western world through the computer. I never understood why she just wanted to wait until I would stop by to do/fix thing. Now I get it. 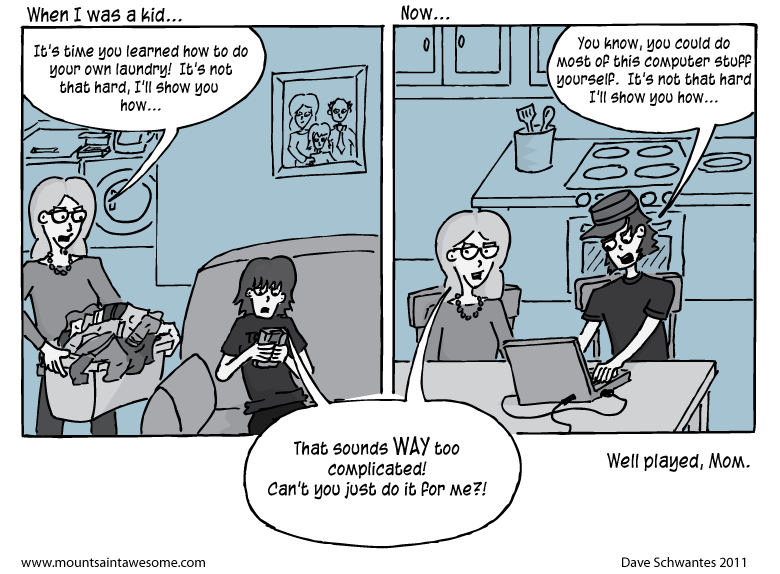 Also, I'd like everybody to notice that in the first panel I am playing an old gray Gameboy. I'm probably either playing one of the Ninja Turtles games or Kirby's Pinball. And if my mom is reading this, sorry that drawing doesn't look very much like you. Now! Shameless promotion time! I've started using a comics tool called Ink Outbreak. It's actually a really awesome way to find and read comic. Check it out! I also use things like Top Webcomics List, Comics Basement, and Top Webcomics. Please click on those links and vote for me! It really helps my traffic! I love the family portrain in the background... because it's freakishly accurate. Well, you nailed it David. Now will you come home and fix my computer? !